“That’s it, enough is enough, I’m switching from property to stock investing." Until recently, I was a small-scale property investor with two investment apartments, but I recently sold up the last of my properties and am now going to invest solely in stocks and shares. Having rolled all our property investments into one, my wife and I will clear $1.25 million from bricks and mortar when we sell up this summer. We'll need to buy another place to live - and houses are outrageously expensive in the city we call home: London. The problem is that the equity in our house just sits there and doesn't generate any income. We're still living as frugally as we did when we were in our 20s. After paying for food, mortgage, my disposable income is less than US$800 per month, which with 2 kids and a car doesn't go far in the UK. 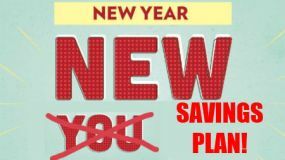 We're saving as many pennies as we can and the income column besides our salaries is empty. 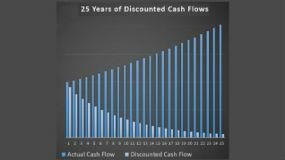 CAN I BUILD MY 20-YEAR OLD INVESTMENT POT - £80,000 (US$103,500) - INTO A DECENT DIVIDEND RETIREMENT INCOME IN 15 YEARS? 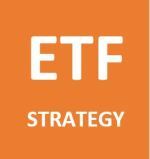 My killer dividend-investing buddy and guru, Mike Roberts, has agreed to answer my questions - and YOURS too! While my apartments were just about turning a profit over the last decade and a half, Mike's stock investments were making him rich! He's the real deal! Comparing Mike's situation with mine has persuaded me to switch from property to stock investing once and for all. This blog is my diary as I attempt to go from a property investor reliant on rental income to a heat-seeking dividend hunter! I expect there to frustration, joy, laughter and probably a few tears over the coming years and I’m going to share it all on these pages. When I was in my 20s I managed to purchase a one-bedroom studio apartment in my home town of Windsor, UK, 25 miles West of London. It was a bit shabby, and although I’m - to risk the understatement of the decade - NO home repair specialist, I asked friends how to do simple decorating, rolled up my sleeves, sanded, painted and updated the property as best as I could with what time and money I had. Ah ... the heady days of owning your first home! Then, thanks to getting a job with a travel company, being accommodated overseas as part of my salary package, I more or less fell into being a landlord. It all started so well: I had bought the property for £109,000 ($157,000 at that time) and the monthly gross income was £725 ($1,080) meaning it returned an impressive 8.25% in the first year. Then, while on a work trip to Johannesburg, South Africa, I read Robert Kiyosaki's "Rich Dad Poor Dad" and my financial life changed. I realised true wealth comes from having assets that pay consistent income and that instead of wasting the cash a wealthy person would re-invest that excess into another asset to generate further income. Then I could simply “rinse and repeat” the whole beautiful process over and over and build a portfolio with larger and larger income. A short conversation later, I learned that the old lady who had lived there had died and her family were renovating the place to sell. Fast forward 6 months and I had split the equity I had in apartment #1 in half to make a second down payment, taken an interest-only mortgage and bought apartment #2 for £125,000 ($181,000) as well. I was 25 and the owner of two rental properties in a great neighbourhood of a swanky town just outside London. Both properties were rented out for good money and the cash was rolling in. So why do I now want to change from property to stock investing? and why would I advise anyone just starting out to change from property to stock investing right at the beginning? The real estate agent recommended lowering the rent, which finally did the trick, after a 4-month void period, costing £3,000 (nearly US$5,000). That should have been a warning sign for me ... Property prices in the town were rising steadily, but my apartment had to be let for less. The return on investment was now 6.7%, still enough to make a profit, but not really what should happen - you’d think that rents should follow purchase prices, right? But, they didn’t. Dozens of people like me had seen the buy-to-let opportunity and flooded into the market using cheap, low down-payment, interest-only mortgages. Turns out that the market had become flooded and I couldn’t reinvest my income easily to provide anywhere like the same return. “Put the cash into a managed dividend-producing unit trust (mutual fund)” recommended by my more-than-slightly dull, bearded financial advisor, “that way you at least stop it eroding from inflation until you find the next property to buy”. Much though I thought he was a play-it-safe loser, I followed the advice of the sensible bearded one. This was my “Next Property Fund” and I pretty much forgot about it. (Little did I know that the reasons for changing from property to stock investing would come from here). Then disaster struck - with the Global Financial Crisis in 2008, the area around London lost a lot of rental clients. No longer were there stunning Dutch executives looking for small apartments. No longer the juicy corporate lets. And to compound all of that, there were dozens of small apartments on the market just like mine. Renters had a field day knocking prices down, pitching one landlord against the next and - rightly - looking for bargain. My rent was beaten down and down between 2008 and 2014. The last rent I received on property 1 was £625. And the worst thing of all is that this 16% was my share action. The mortgage costs - thank goodness - fell dramatically (mortgage rates were cut in the UK from 5.75% to 0.50% in this period) but agent’s fees (as a percentage of rent) dropped only by a few pounds, and the cost of making repairs actually went up as tradespeople put up their prices in line with inflation. So to sum the whole damn mess up - I was the one who was losing out, not the suppliers. The profit from the properties was more or less halved. 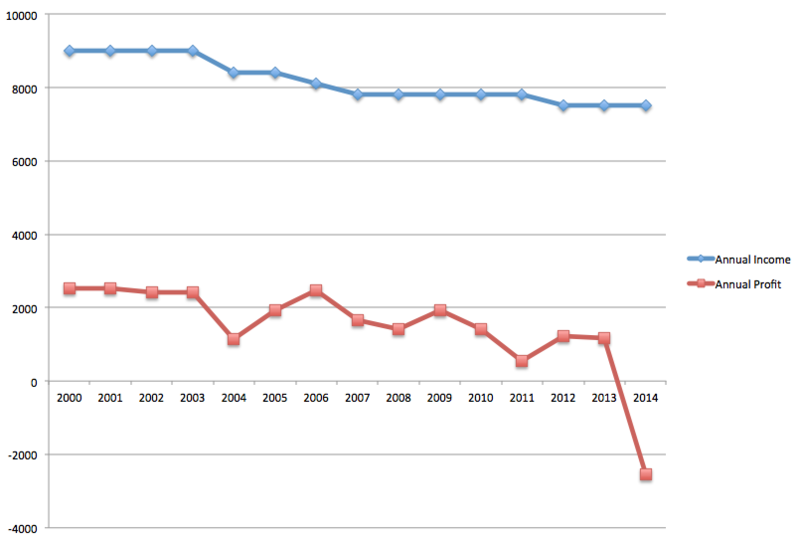 Here’s a graph of that income - gross in blue, net in red. I kept getting my reports about what was happening to my “Next Property Fund”, though, and while I had been taking a pounding on the properties, the income-producing unit trusts had continued to produce income (despite hefty management fees - I know Mike ... I’ll never do that again!) and I reinvested that income at the end of each year. Fast forward to 2014, 4 years of the Global Financial Crisis and 2 years of pretty decent recovery. My apartments were making virtually nothing. The great corporate clients never returned and the quality of the tenants fell dramatically, meaning higher turnover and more void periods. 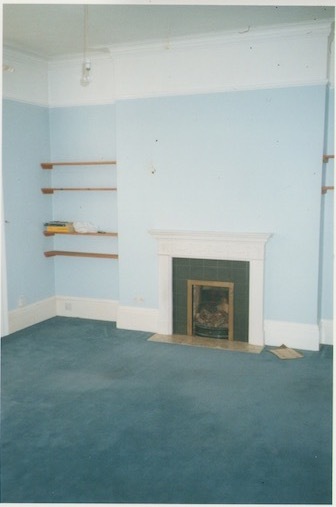 The last young couple who moved into apartment 1 (my precious first home) all but wrecked the place, got behind on their payments to the tune of 3 months’ rent, split up and consequently left me with no-one to take easily to the small-claims court for my £1,800 ($2,790) of outstanding rent. Furniture = ruined. I'm not the only blogger to have suffered this fate. Expert property investor, Sam, from Financial Samurai has had his pain at having rough tenants. 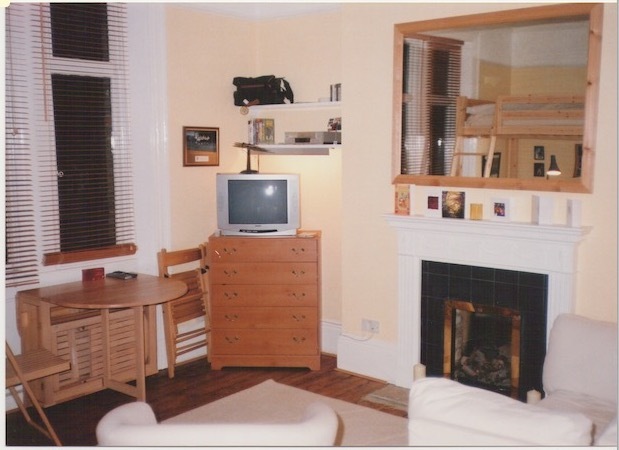 I could no longer let the flat as furnished, which cut another £50 off my monthly income. But the ultra boring “Next-Property-Fund” was turning a very tidy profit. Over the 14 years it grew at a shade under 10% and was returning 3.4% in income at the end of that period (i.e. 3.4% of the latest price). Here, staring me in the face was the reason I needed to change from property investor to stock investor. Despite a double dip in the London stock exchange's value, I had made both a capital appreciation and a decent income. The writing was on the wall - if I had followed my bearded financial advisor’s advice and switched from property to stock investing with the whole of my down payment on the apartment #2 a decade before, I’d be so much further towards my goals of early financial freedom. REASON TO CHANGE FROM PROPERTY TO STOCK INVESTING #1. The income from my dividend-producing unit trusts was relatively stable despite the Global Financial Crisis. That is to say, the dividends didn't drop as dramatically as the stock prices. Peter Thornhill also had this experience during the financial crisis. REASON TO CHANGE FROM PROPERTY TO STOCK INVESTING #2. Monthly re-investment of dividends averages the ups and downs of the market. Some may even subscribe to a DRIP which re-invests automatically. REASON TO CHANGE FROM PROPERTY TO STOCK INVESTING #3. You can’t easily re-invest profits from property - you need to save up for some time for a new deposit, find the right property and then transact the purchase. It all takes time and that means time out of the market earning money. REASON TO CHANGE FROM PROPERTY TO STOCK INVESTING #4. Property rents do not rise as fast as dividends. In fact in my case they actually fell over time. Although this might be a peculiarity of the market I was investing in, having spoken to various owners of residential property, I believe it's quite common. Dividend Aristocrats come across as more appealing. REASON TO CHANGE FROM PROPERTY TO STOCK INVESTING #5. It’s very difficult to raise rents without associated costs in the form of renovation and re-marketing the property to new tenants (meaning void periods with no rental income). REASON TO CHANGE FROM PROPERTY TO STOCK INVESTING #6. The only advantage of property investment is easy access to borrowing for leverage. But borrowing too ambitiously brings risks with it too, especially when the purchaser over-stretches to buy a property. You don’t have those risks with stocks, because the asking price for a stock is minuscule compared with the asking price for a house, so the risk of over-borrowing is smaller and you can always liquidate some of your holding if you realise you have been over-ambitious. REASON TO CHANGE FROM PROPERTY TO STOCK INVESTING #7. Diversification is much more difficult in property. Whereas you can buy 20 stocks in different industries and different continents in less than an hour and only need a small amount of cash, you’d take months if not years to go through the buying process for 20 properties and you’d need a pile of cash. For most of us, buying one property is a significant event, and you’re tied to that area and the rental market in it. If it sinks, so does your entire investment! REASON TO CHANGE FROM PROPERTY TO STOCK INVESTING #8. Property - for me at the least - is an emotional business. Shares are much more hassle free and as they are not "tangible" I don't believe I'll be so emotionally tied to them. That is to be tested in the stock market though! REASON TO CHANGE FROM PROPERTY TO STOCK INVESTING #9. Selling properties can be a difficult and disappointing business. My wife and I have owned a total of six properties in our lifetimes and only once have we managed to sell for what we had previously estimated the value to be. 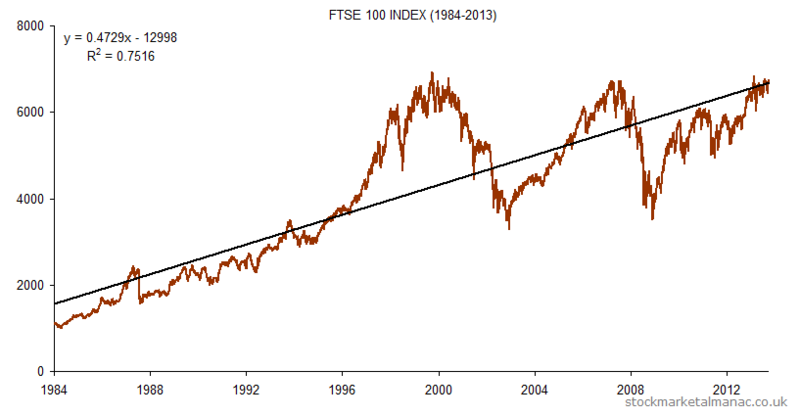 Stocks are bought and sold at predictable prices (market makers don't haggle you!) and there is always a ready market. REASON TO CHANGE FROM PROPERTY TO STOCK INVESTING #10. In areas where property prices rise rapidly, governments are increasingly targeting taxes at buy-to-let landlords to cool the market and I can only see this increasing in more and more countries when policy makers realise it's popular with the voters. So that's my starting point for changing from property to stock investing. 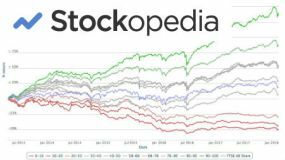 Please join me on my journey from property to stock investing via this blog! Yes, I would have been far better off investing in stocks and shares and then putting my feet up for the next 14 years in 2000, but I did still end up in profit, and sold the properties for more than I paid for them, even if it was less than I had hoped! Mike would say it is all about opportunity cost, though, and picking the assets with the highest likely returns. I know the Global Financial Crisis caused many people proper loss and heartache, so please forgive me my slight over-dramatisation of the situation!